This theatre existed in the early decades of the 20th Century and was located on Main Street near the corner of what is now Roosevelt Avenue. Here is a photo of the Globe Theatre from early in the 1900s. Wow! Great picture Gerald and hopefully more info about this theater will become available! For some reason, I seem to fall for theaters that were transitional from the ‘vaudes’ and ‘flickers’ to the ‘talkies’. he-he, I just seem to have a hard time finding affection for late model theaters especially the megaplexes of our days. When I first found that picture (I think on the “Images of R.I.” website) I couldn’t make out was the name was…then I went through a list of known Pawtucket theatres and finally made the connection and posted it. Yes, I agree, I’d give all the ugliplexes away for one day at a characterful theatre like this Globe. Gerald, thanks once again. I’d never heard of this theater! My family immigrated from England in the early 1920s, so probably this didn’t last long after they were here, or had probably gone from their memory by the time I came along and became interested in movies. The building with the “spire” on the left is probably the bank at the corner of East Avenue, which crosses Main street and is the next intersection “up” from Roosevelt (as you no doubt know). Just behind the bank on East Avenue was the Strand, where I worked as a candy girl. Marialivia, here is a southerly view of the bank on the corner of Main and East Avenue. It is the Slater Trust Bank and I think it became the Old Colony many years later. I believe the building with the spires was later razed and replaced with the Albert Vitale building and yes, it was also a bank (with a walk up night deposit drawer) but not the Slater Trust on the corner. Look at Gerald’s picture of the Globe and notice the Music Hall two buildings up. 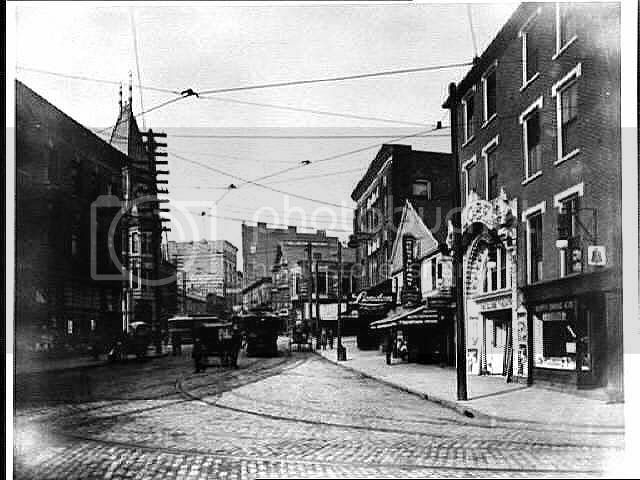 Then look at this picture and see the Music Hall and directly across the street is the white Vitale building. This picture was about 1925. This is fun!! Marialivia, oops, Slater Trust became Pawtucket Savings and Loan first. Sorry. Roland: These are wonderful — i’ve looked at all the photos and wonder what the “Benedict House” was? A hotel maybe? As to the Slater Trust Building at the corner of East and Main, it takes me a minute to become oriented, mostly due to my world-famous poor sense of direction. As I look at the “southerly view,” am I correct in seeing the old ticket booth of the Strand just a bit further down on the same side of the street? Wouldn’t this view of the bank be on East Avenue? Also, Gerald’s photo of the Globe at the corner of Roosevelt and Main would be on the same side of the street as Main Street as the Music Hall, but it would be more than two buildings up. Hadn’t we established that the Music Hall building was the very same that later housed the Peerless Company? One would have to walk up Main Street (west? ), cross High Street, and the Music Hall would be several buildings beyond that. I distinctly remember the name “Music Hall” etched into the stone on the front of the Peerless, right up until the time I moved from Pawtucket. And I believe you or Gerald posted an old photo where the “old” Peerless Co. occupied the first floor and the Music Hall was upstairs. Obviously, i need to inspect these photos again! Marialivia, I stand corrected! I jumped the gun. Disregard anything I said about the Music Hall in this reference to the Globe. As far as the southerly view of the Slater Trust Bank, that is correct but I think this view is from the early 1900’s which would predate the Strand. Hi Roland! You are absolutely correct about the Bank pre-dating the Strand. I guess it was just wishful thinking, but it does look like an overhanging marquee or something, right where the Strand once stood. It has occurred to me that these theaters didn’t really last a very long time (except in the case of the Leroy, which was held onto long after its heyday and unfortunately became a haven for the pigeons). I believe the Strand was razed for a parking lot around 1958. Incidentally, there is a 90-seat cinema inside the Blackstone Valley Visitors Center at 175 Main Street. If I remember correctly, the seats came from the Leroy; the spirits of two Pawtucket movie houses live on!